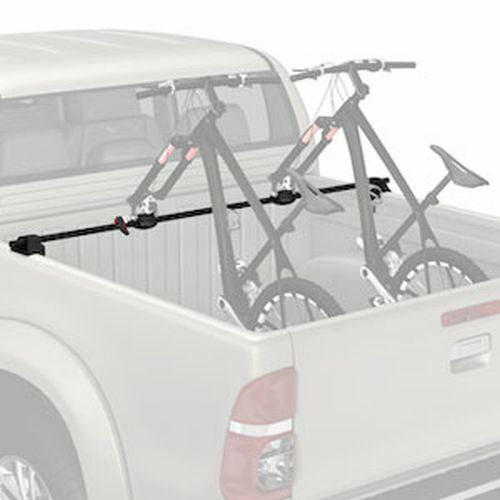 Bike roof racks, receiver hitch bike racks, trunk bike racks, SUV bike racks, spare tire bike racks and pickup truck bike racks are stocked and discounted at The Rack Warehouse. All of the most popular brands are in stock including: Thule Bike Racks, Yakima Bike Racks, RockyMounts Bike Racks, Saris Bike Racks, Whispbar Bike Racks, Inno bike Racks, Rhino-Rack Bike Racks and more. Bike Racks that hold your bike by the front fork, bike racks that hold your bike by the frame and bike racks that hold your bike by the tires are the most popular roof rack mounted bike racks. Trailer hitch mounted bike racks usually hold your bike by the top crossbar, down tube or bike tires. Trailer hitch mounted bike racks are made with aluminum or steel and are designed to fit either a 1 -1/4 inch receiver, 2 inch receiver, or both. 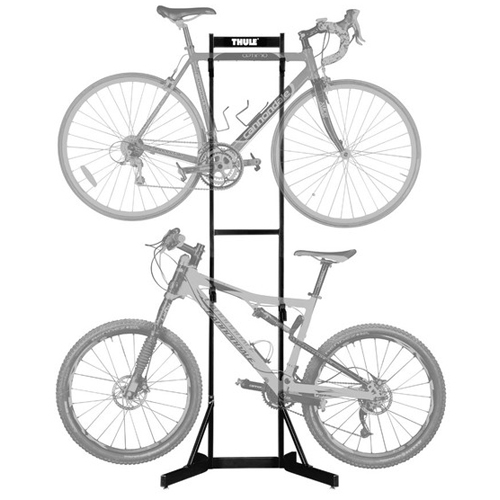 Most bike racks offered by RackWarehouse.com are capable of carrying road bikes, mountain bikes, women's bikes, kid's bikes and a variety of unique frame styles. 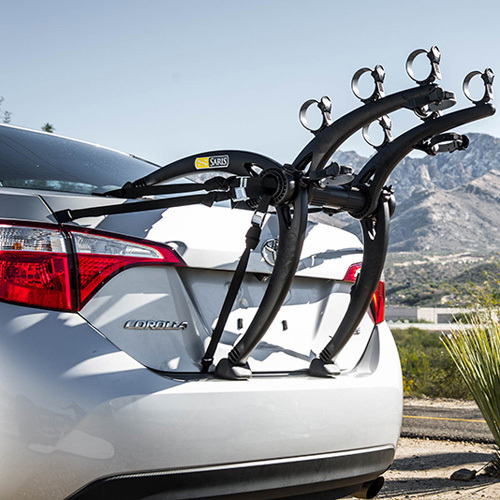 Trailer Hitch Receiver Mounted Bike Racks and Carriers from Thule Racks, Yakima Racks, Rhino-Rack, RockyMounts Racks and Saris Racks are available in an array of price points, styles, colors, carrying capacities and features. Trailer Hitch Receiver Mounted Bike Racks mount into a 2 inch or 1-1/4 inch trailer hitch receiver and carry from 1 to 5 bicycles - depending on the model you choose. A trailer hitch receiver is required. Features like fold down arms, tilting masts, swing-away bases, hitch locks, locking cables and bike stabilizers are available on specific models. 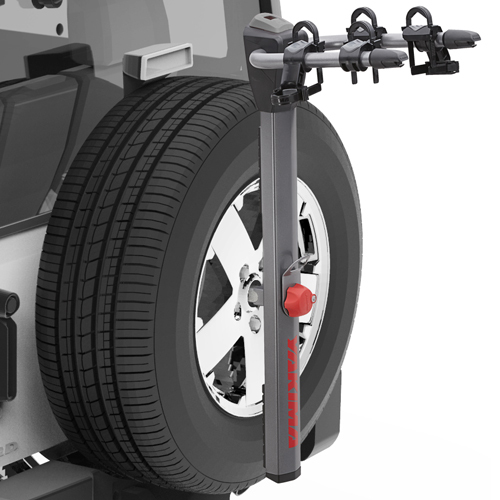 Be sure to view each Trailer Hitch Mounted Bike Rack thoroughly to find the perfect rack for your needs and budget. 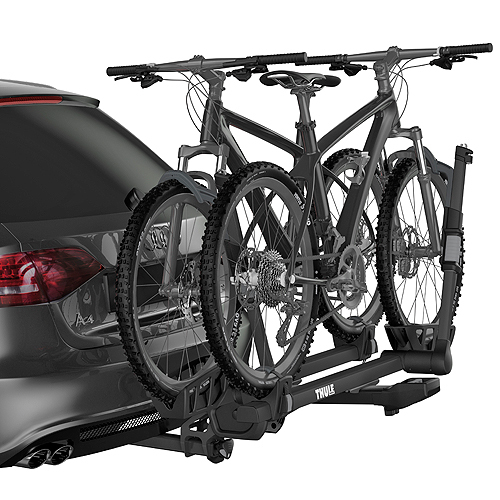 Thule Roof Rack Mounted Bike Racks, Yakima Roof Rack Mounted Bike Racks and RockyMounts Roof Rack Mounted Bike Racks are designed to fasten to a roof rack and carry your bikes above the roof of your car, van, SUV or pickup truck. 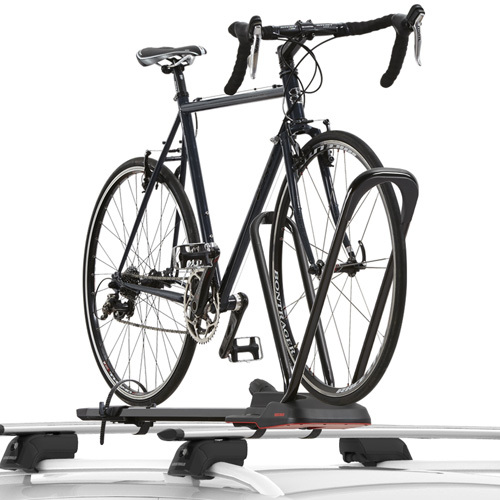 Car roof rack mounted bike racks attach and support your bike by a couple of methods. Fork mounts carry your bike by the front fork - once your front tire is removed. Upright bike racks hold your bike by the front tire or down tube. All rear tires ride in a wheel tray and are fastened in place with ratchet straps. RackWarehouse.com stocks and discounts all roof rack mounted bike racks from Thule, Yakima and RockyMounts. Plus, when you spend over $99 your order ships free. If you need help choosing the ideal rack for your needs and budget, please call us at 800 272-5362 for assistance.